Brain Injury:When I was 17, I was a passenger in a car that was speeding. We were all drunk, veered off the road, and hit a tree. 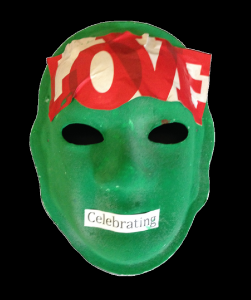 Explanation of Mask: To me, green represents spring, and a new life. I chose the word love to describe the deep love I have for my baby sister, and her husband Joe. The word celebrating represents how thankful I am to be alive. I am celebrating each and every day.